I've spent several years working within the social media industry and more recently within the employee advocacy space. I'm a big believer that brands will find it increasingly difficult to get their voice heard on social media. Social networks such as, Facebook have already changed their algorithms to reduce the likelihood of brands reaching their audiences through organic posting. In 2012 Facebook reduced the organic reach of brand content to around 16% so of all the posts organically published to a brand channel, only 16% will feature in the audiences news feed. They been reducing this number ever since and today it hovers around 6%. Twitter boasts a high organic reach of 30% for brands although independent analysis suggests it's closer to 10%. It's obvious why they're doing this - they need a revenue stream. Brands will have to increase native paid social spend to get any chance of being noticed via social media. However, smart companies are embracing a new trend - advocacy. For the last 18 months I built a program at SAP, training an engaged workforce to help them build their personal brand online. It's great for employees who want to increase their professional profile online and great for the brand to showcase the talented workforce they have working for them. Training a workforce to be socially active is the first step. Suggesting content for them to share is the next. Measuring contribution to the business is the final step. In the case of SAP, we used the Dynamic Signal platform which had more than enough functionality to create a solid advocacy program with great success. 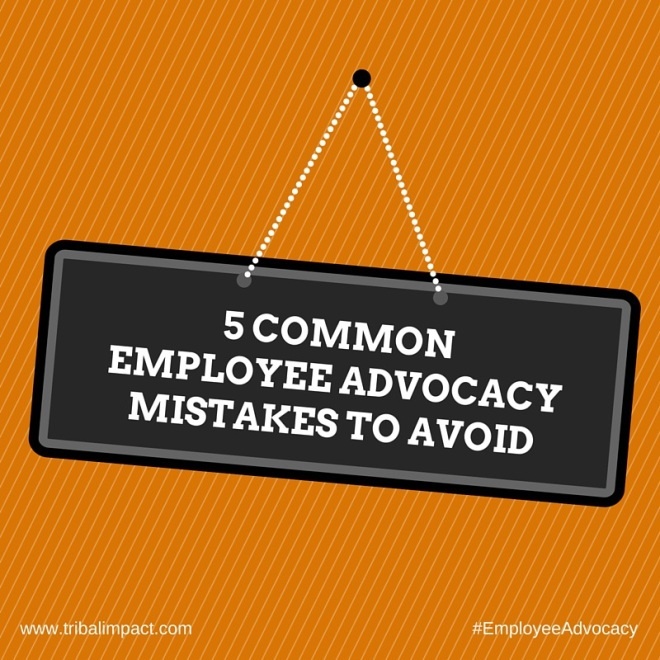 Here are some mistakes you should set out to avoid if you're planning to implement an employee advocacy program. Launching A Program When The Workforce Is Disengaged: Jay Baer sums it up brilliantly. "If your employees aren't your biggest fans, you've got problems WAY bigger than social media". 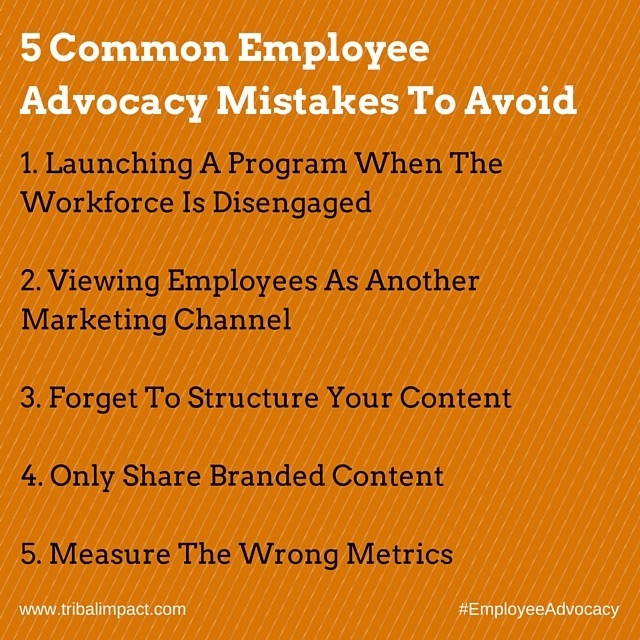 Employee advocacy cannot be forced. The first thing you need is an engaged workforce. If you have unhappy workers the chances are that they're not likely to advocate your brand. It's essential that you work together with HR to build a workforce that understand the brand, what the brand stands for and is able to tell the brand story. Viewing Employees As Another Marketing Channel: Your workforce is not another marketing channel. They are individuals who should be taught how to build their personal brand online by creating best-in-class profiles, sharing content around topics THEY are passionate about and even create content such as blog posts. Build social competency within your workforce...not robotic amplifiers for marketing. If you take this approach from the start, you will find success. Sure, employees who advocate the brand can and will support your marketing effort but that shouldn't be the driving force behind the program. Forget To Structure Your Content: Before you fire up your employee advocacy software tool (and there are many to choose from including Dynamic Signal, Social Chorus, Influitive and EveryoneSocial) think about the structure. Divide it up into logical sections most relevant to your internal target audience e.g. make sure your HR department only see content relevant to them and their networks. If you don't do this, you'll find adoption of the tool will decline over time as the content becomes irrelevant for users. This is not what you want. Think Marketing. Think about targeting your internal audiences with relevant content to share. Only Share Branded Content: Don't just share branded content with your employees. They will want to protect their personal brand and if they're seen only publishing branded content it impacts their credibility and authenticity. Use employee advocacy tools as a way of supplying third-party content to your employees as well as branded content. Import trending articles that aren't brand related will help them continue their professional development. It's okay if they pass these on to their networks. Social is about sharing and connecting...being of value to your network. Measure The Wrong Metrics: Like with any social program there are so many things you can measure. Impressions, likes, comments, shares..the list goes on. I personally would look beyond some of the vanity metrics. Employee advocacy costs money and no business will invest unless they see a return so you will have to tie advocacy back to the business in some way. Take a look at the value of clicks rather than the number of clicks. How much would those clicks cost if you were to do a paid social campaign in LinkedIn for example? Look at how much traffic was driven to a blog post as a result of employee shares? How many of those went onto download an offer from your website? How many attendees registered for your webinar as a result of employee shares? All of these metrics can be measured using tracking links within the advocacy tool and will help you justify the investment back to the business when you compare against the performance of brand social channels. 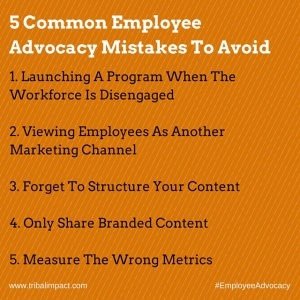 Learn more about employee advocacy metrics that matter here. Can you share any employee advocacy mistakes to avoid? Share in the comments below! Related Posts: "We Don't Have a Marketing Department...Our Customers do That For Us"